OUR ON-SITE PRESENTATION CENTRE IS AVAILABLE BY APPOINTMENT ANYTIME. 5429 ROBLIN BLVD. PHASE 1 & 2 SUITES FROM 944-2332 SQAURE FEET. The vision of the entire development team was to create an architecturally distinct and aesthetically pleasing compliment to the existing natural surroundings. Conveniently tucked away between Roblin Boulevard and the Assiniboine River, the views from each residence will leave one gazing. The inner courtyard has been designed for your use and enjoyment. Enjoy the manicured green space that has been developed with your outdoor enjoyment in mind. The inside facing suites will have the most beautiful and stunning year round views that will be enhanced with plantings, gardens, manicured grassed areas, trees, outdoor patio areas, a central fire pit feature, trellis seating, tiered planters, bench nodes and meandering strolling paths. This space has been strategically and architecturally designed to maximize people activity and provide a lifestyle that encourages outdoor causal living at its best. Our inner courtyard is designed to be a central meeting place for the Roblin Grove community. From the grand meeting circle complete with fire pit, seating, trellis and gorgeous landscaping this is a truly welcoming and unique feature of Roblin Grove. The stand alone Pavilion is located at the east end of the green space and will be the ideal common gathering space to hold parties and meetings. Good taste is the defining feature of Roblin Grove. A smart attention to floor plan detail has been interwoven with deliberate design elements. As a result, a timeless yet current design has been achieved and will sustain. Smart & Spacious Floor Plans! With 15 floor plans to choose from there is a great selection to choose from. Careful attention to architectural detail is evident in each unique floor plan. Smart storage space, natural lighting, and functional use of each square foot can be appreciated in each thoughtfully designed suite. The soothing sounds of the natural geography is yet another added bonus. One can take in the natural surroundings of the river and wildlife environment while superior soundproofing technology keeps each suite private and exclusive. 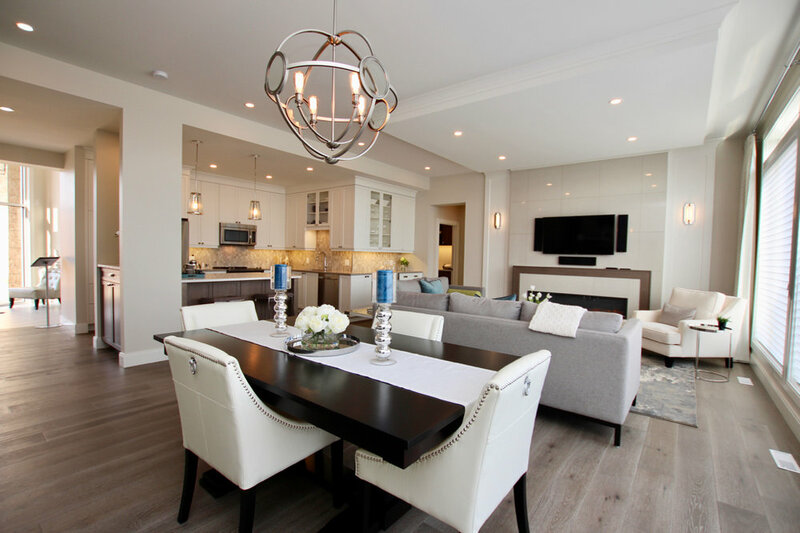 Roblin Grove condominiums are nestled on the east side of the upscale community of Assiniboine Woods, only a few minutes drive to some of Winnipeg’s newest and hottest shopping, restaurants and amenities. Roblin Grove condominiums have been designed to provide a calming sense of quiet serenity, while being surrounded by generous green space and landscaping features that include a winding path way to the Assiniboine River through the naturally forested riverbank area. Feel naturally at home with the aroma of family dining ever present. 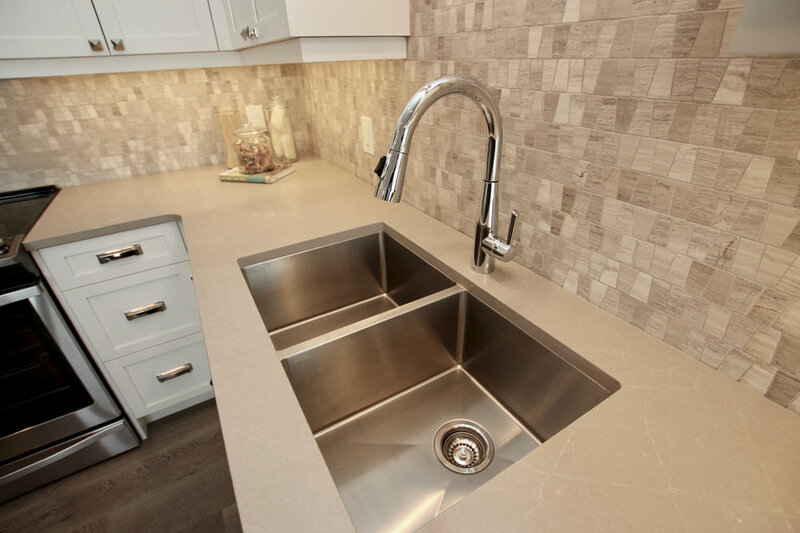 Each kitchen space is designed to gourmet standards. Plenty of preparation and dining space is made available with professional designer touches found throughout. Talk with our designers to select your luxury kitchen package. 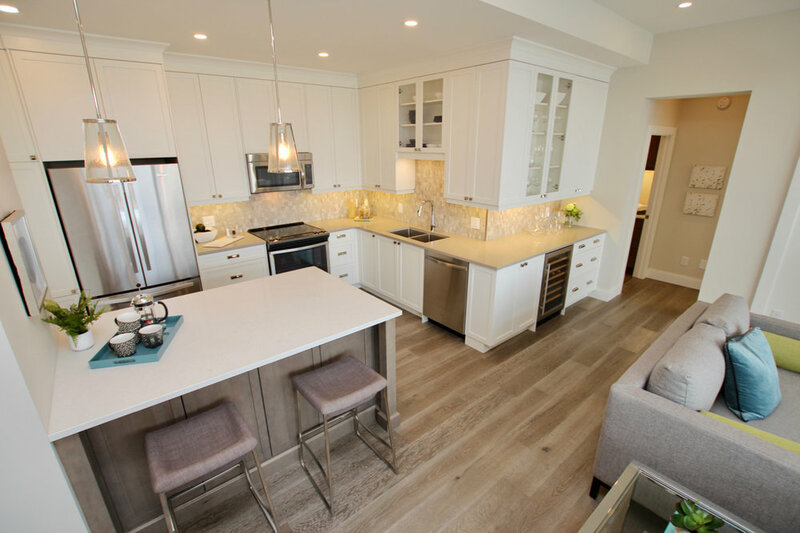 Quartz counter tops, solid cabinetry, high end appliances, and superior millwork found throughout. One touch is all that’s necessary to experience the quality craftsmanship evident throughout. Careful attention to detail combined with a selection of high-end material options defines a new standard of tangible luxury. 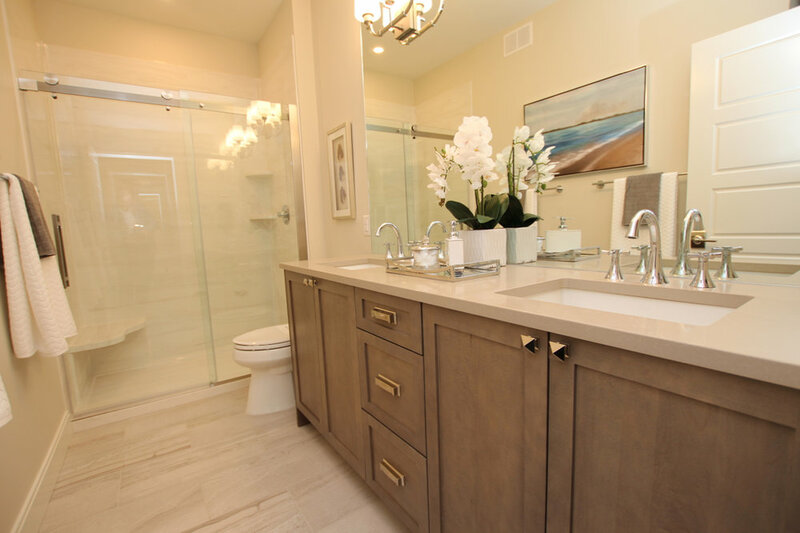 Roblin Grove interiors have carefully crafted layouts with built-in style and streamlined features that we know you will appreciate. The innovative specifications and finishes not only look great but will enhance the way you live. The innovative building features, modern living solutions along with the striking layouts make Roblin Grove outstanding in every way. The Chefs kitchens with luxury appliance packages, the designer selections, security features and advanced technology smart wired features are benefits that will enhance your life. 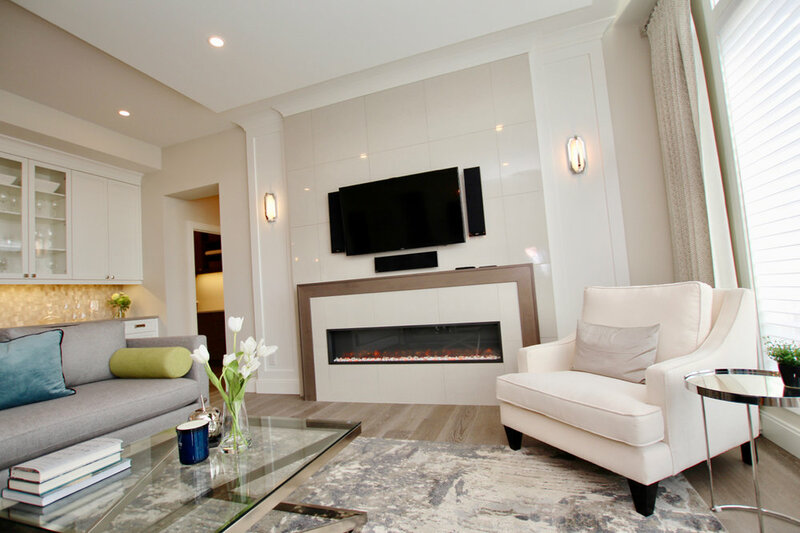 Whether classic, contemporary or city chic you’re sure to find your style at Roblin Grove. *All plans, pricing, and sizes subject to change without notice. Specifications and representations are preliminary only and some variation may occur.